Aruba welcomes you to a luxurious tropical vacation. 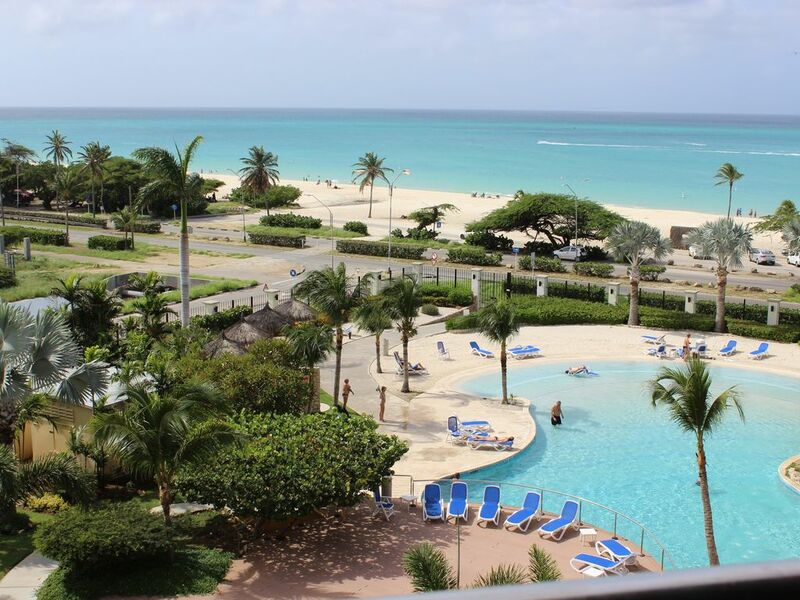 Our penthouse is located on the best beach in Aruba. The beach front location provides guest an easy access to the beach. We strive to provide first class accommodation to our guest at reasonable price. Our rate is significantly lower than the time share of Marriott Ocean club or Surf club. It is also a fraction of the price of the newly built Ritz Carlton Hotel rate. Our Penthous is located inside the Oceania Luxury Condo Residence on Eagle Beach. Eagle Beach is the best beach on the island. Eagle Beach has 3 miles of white powder sand. Eagle Beach is a low rise hotel zone. This ensures low tourist density. No need to get up early to claim your beach chair. This top floor Penthouse is one of the most luxurious accommodations on the beachfront. It has a roof top private terrace(2100SQF) with large outdoor Jacuzzi. The penthouse includes three spacious bedrooms, Three modern bathrooms (master bath w/jacuzzi), chef's kitchen, three ocean view balconies. Local onsite manager will provide first class guest service including car rental, restaurants recommendations etc. We provide luxury Ralph Lauren Beach towels, luxury high thread count bed sheets, bath towels., tropical theme high quality furniture firm and comfortable mattresses. The penthouse has a split floor plan and equal number of bathrooms and bedrooms. Modern kitchen provides an opportunity for family to make delicious meal without paying high restaurant price. The grocery stores are just one mile away. The resort also has club house and business center. High speed internet and wireless internet service is free of charge. Four swimming pools, tennis courts modern Gym will entertain guests of all ages. Aruba has a rich multi-cultural heritage and many exciting recreational activities.There are many fun things to do on the beautiful beach including, jet skis, snorkeling, and boat tours. There is a butterfly preserve and ostrich farm for the kids, and great restaurants, music clubs and casinos for the adults. Aruba enjoys steady trade breezes and beautiful tropical weather - full of sunshine. It sits outside the hurricane belt and experiences no strong storms and little rain. Send us a message through the Homeaway website requesting the dates you prefer. We will respond promptly. Book it directly on the Homeaway website! Reservation made within 60 days of arrival does not exempt from the refund policy. Full amount has to be paid at the time of reservation if arrival date is within 30 days. First Class Guest Service: We make all efforts to provide you with first class service. We will respond promptly to any questions or requests. We are accessible to you while you are in Aruba. Most important, we have an on site property manager to take care of all our guests need. We can arrange the following service for you before you arrive: 1. Daily maid service 2. pre arrival grocery shopping 3. professional chef service 4.babysitting service 5. rental car reservation. Our local property manager will greet you at the check-in and answer all your questions about Aruba and the Penthouse. She is an American from NJ and a local expert with understanding of first class guest service. She will meet with you when you check-out to make sure you have a enjoyable vacation! We are world travelers and fell in love with Aruba. We especially enjoyed Eagle beach in front of Oceania, so much so that we decided to own the best penthouse in the Resort. Many of our guests bring their friends and family to our penthouse to celebrate Weddings, Anniversaries and Birthdays. Our local manager Randy is always there to make the guests feels like home. Beautiful Eagle Beach - 3.5 miles long of white sand beach Friendly and safe vacation island - Aruba is one Happy Island No Hurricane ever and very little rain (average 16' a year!!). There are many fund things to do in Aruba. Water sports, golf, casinos, restaurants and bars are all within walking distance. The penthouse has three bedroom and THREE bathrooms and conviniently located in front of the Eagle Beach. The roof top terrace is the most attractive feature. Guets can relax and sunbathing on the private terrace and soak in the Jacuzzi Tub with a cold drink. Now that is a tropical vacation!! The Penthouse is brand new in 2008. It has three full modern bathrooms with top end bath accessories and first quality bath towels. All bathrooms has marble floor tiles and marble counter tops. The Jacuzzi tub and the bathrooms will be throughly cleaned and sanitized before guests arrive. All beach towels and bath towels will be washed and sanitized. The masterbath has a Jacuzzi whirl pool bath tub and separate shower. We provide shampoo, conditioner, soap, toilet paper, bath towels and beach towels, 8 beach chairs, 2 beach umbrellas to all our guests. The large Jacuzzi Tub on the roof top terrace gives our guests a chance to enjoy the beautiful ocean view and relax in the ocean breeze. So please COME and JOIN us in Aruba!! Please do not forget tp pack your own sunscreen and sunglasses. Trust me, you will need them in sunny and beautiful Aruba!!! Penthouse has three ocean view balconies. The Oceania Condo Resort is 15 to 20 steps away from the Eagle beach. The ocean is 100 feet from the balconies. Beautiful ocean view from all three balconies and roof top terrace. Ocean is just 100 feet away. Zoned Central air conditioning in all the rooms. Guest controlled didital thermostats. A/C is maintianed regularly. High thread count best quality bed sheets, pillows, bath towels, beach towels are provided. Assigned parking spot plus visitor parking inside the resort. High speed internet and Wifi is provided with no charge. Club house has modern gym. Tennis court and pinpong table inside the resort. Large sofa with large 40 inch flat screen TV. Stainless Steel double door with ice maker. Eletric cooking range with full size oven. Luxury Whirl Pool appliances: Range, oven, Dishwasher, Micro-wave, double door refrigerator, coffee naker, toater. Cookng pots and Pans. All dining plates, drinkware are provided. Dinig table seats six. Kitchen counter top seats four. Cable TV. Each bedroom and the living room has its own TV inside. There are FOUR TVs (three 40' and one 32' LCD flat screen) in each bedrooms and the living room. Children Playroom in the Club house. Three ocean view balcony plus the private roof top terrace. Roof top private terrace with table and chairs, lounge chairs and Hot Tub. Club house has sauna for all the guests. Four swimming pools inside the resort. Kiddie pool with beach entry for safety. Private roof top hot tub Jacuzzi located on the roof top terrace. The luxurious modern kitchen is equipped with whirlpool stainless steel appliances, a 4-seat dining bar-table, and a large formal dining table can be expanded to seat 8-10 people. The kitchen is equipped with all the cookware, dinnerware and glassware and a tropical style bar for an avid chef. There are THREE 40 inch flat screen TVs for your enjoyment. The Penthouse has three full modern bathrooms with top end bath accessories. Two of the bedrooms have king-size beds. A third bedroom has two attachable twin beds. The living room has a comfortable queen size sleeping sofa. Additional roll-away beds with pillows/linen are available and can be comfortably used in this premium penthouse. A full size washer and dryer are located inside the unit. The Oceania resort includes a large free-style swimming pool with a waterfall, a modern fitness center, sauna, business center, tennis court and kid's playroom. The resort has beautifully designed garden with exotic tropical plants and flowers. Fantastic location. Owner actually gave us a call before arrival and was very helpful . Staff on site was always very attentive .Walk across the street you are on the Beach .They have thought of everything to make beach enjoyable ( beach chairs and cooler). Hot tub and nice pools. Location provided reasonable places to eat and party . Short ride to high rise or in to town .Three large bedrooms . One of our best vacations ever. We loved the condo - it had more then enough space for our family of 5!! The balcony faces the ocean - it was our favorite place. We feel that Eagle beach is the best beach on the island and it’s a very short walk from the condo. We felt very safe staying at this resort. Everything exceeded our expectations. We highly recommend this unit! Great view and plenty of space for 3 families! We loved our week in Aruba and our place was great to share together. Thank you so much. Master and 1 other bedroom were fantastic but the 3rd bedroom if you have a couple in that room these want to share a bed the beds are too small for 2 people. If you do wash do it during the day - the washer and dryer are very loud - but they worked!! This was an amazing condo, with oceanfront views. We were 10 people (7 adults, 3 kids) had plenty of room to accommodate us. The unit was clean, spacious. Kitchen had everything we needed. The ground were kept nice and clean. Pools were great. Rates are subject to change until reservation is confirmed. Holiday rates apply for Christmas/New Years.